Every hunter has their favorite hunting spot and that is also true of guides. However, as an outfitter, having six to eight hunters at a time, three times during our fall season, I needed around ten different campsites so I could rotate their use. I was always on the lookout for new camps. In our Western Alaska area I was registered to hunt in units 17 and 19. The Alaska Department of Natural Resources would only allow me to use a camp for fifteen days straight then it had to be moved. That was another reason I needed as many campsites that I could find. The first thing required for a campsite was a place to land a super cub. Unit 17 had many flattop hills or mountains so finding camps in that area was not a real problem but the moose season was only ten days long so I had to divide that between two different hunts. Five days for our moose/caribou hunts and five days for our moose/caribou/brown bear hunts. The moose season in Unit 19 was fifteen days long so if a client on a three specie hunt didn’t get their moose during the first five days, I needed to move them to unit 19. The problem with Unit 19 was there were fewer places for me to land. The tundra was way bumpier and there weren’t many flattop mountains. The second year that I had that area however, I found one place to land in Unit 19. Everyone called it “Hell Mountain” because the wind was always blowing hard from the Northwest and to get to the camping spot you had to go at least 200 yards down the mountain making four or five trips carrying tents and the camp gear. You could practically see the world, as Sarah Palin might say, from the top. But because it was close to 2000 feet high everything you took below had to be packed back up the mountain. Everyone hated that camp even though we killed some great trophies. I rotated the guides so they would only get that camp every other year or so. I even had to fire one guide because he refused to go back. Chuck "Mik" Miknich on the left with his client Sonny Pearcy, WV, and Sonny's beautiful 59" moose. I met Chuck Miknich when I was stationed at Galena, AFB Alaska. He was the Maintenance Supervisor in charge of the Alert Cells. I was in charge of the Missile Shop and reported to SMSgt. Miknich. I was still a TSgt at the time. During our off duty time Chuck, who was better known as “Mik,” and I played basketball for the Alert Cells’ team. After our year remote was over we both were reassigned. I returned to the Missile Shop at Elmendorf, AFB in Anchorage and Chuck went down to the states. He was later reassigned back to Aircraft Maintenance at Elmendorf, AFB. Our paths would cross a few more times before we retired from the Air Force with both of us staying in Alaska. After I retired, Brent and I formed AAA Alaskan Outfitters and Chuck started doing specialized float fishing trips. AAA was looking for good guides so I asked Chuck if he was interested. He said yes, obtained his assistant guide license and began working for us. He worked in the Wrangell’s the first couple of years then started working in our Western Alaska area in 1989. After spending a couple of hunts on “Hell Mountain,” he knew the lay of the land and hated packing everything back up the mountain. He had a client kill a 9’5” grizzly one afternoon and they didn’t get back to camp until 2:30 am. Like everyone else he liked the area but just hated the location of the camp. In the spring of ’94 when I was getting my guides lined up for the fall, Mik said he really missed hunting with his two sons and was thinking about not guiding that fall. He wanted to know if maybe we could work a deal where they could come out and hunt the first hunt with him. I said that would work if they would build me a landing strip in unit 19 during that time. Both of his sons were in great shape as they had played hockey most of their lives through high school and even played a year in college. We decided I would drop them off on “Hell Mountain” and they could hike off the mountain and make a strip down by Maka Creek. We would decide the exact location that fall. Fall season rolled around and Mik flew into camp in the cub with me as usual. His two sons, Bret and Eric, came in a few days later in the “Goose” after being weathered in at Dillingham. Bret was the oldest and had recently received his Doctor of Optometry degree. Eric, the youngest, was just finishing up college and found out while he was in camp that he had just been accepted to medical school. It was pretty cool having a doctor and a soon to be doctor making AAA a runway. Both are great guys. I showed Mik from the air were I would like the strip and then ferried them in the super cub to a point next to “Hell Mountain.” It was about 500 feet lower and a half mile closer than “Hell Mountain” where they were going to build the strip. They had a pick and three shovels and minimum gear. I told them I would drop off the rest of their gear and supplies that evening after they had made the strip. I showed up later that evening and could see that they had been hard at work but only had time to clear about 150 feet of the new strip. With no wind at the time I knew landing was going to be a problem. The hummocks at one end were between 2 and 3 feet high and the other end had a thirty foot bank. If I had any chance of making a safe landing I would have to come in below the bank and use part of it to touch down. I made four or five attempts before I finally hit my spot coming up the bank. I still bounced and down the strip I went. Holding my stick back and applying my brakes softy so that I didn’t go over on my nose, I hit the hummocks at the end. I finally stopped about 25 feet past the cleared strip and managed to taxi out without going on my nose. The last portion of the landing was basically a controlled crash, another close call. After I got out of the cub I told them they did a great job but asked why they didn’t make the strip up and down the valley into the prevailing wind. They said the wind had been blowing hard all day in the direction that they had built the strip. I then showed them the direction I wanted the strip to run which was flatter and would be far easier to clear a 300 foot strip. Some of the hummocks that they knocked off while clearing the other strip were between three and four feet high and the same width. That was a tremendous amount of work. They had broken one shovel but still had enough equipment to finish the job. We unloaded their gear and I told them I would check on them in a couple days. They were in an area that more than likely no one had ever walked in before, so this was going to be a wonderful experience. My take-off was in the direction that I wanted the strip to be built. Two days later after I had checked on a couple camps and found that one had a moose down; I came back to base camp to pick up my packers. That was the day the super cub got blown into the lake. You can read the details in my story “Cub in the Lake.” One of my problems during that time was Mik had the camp shovels and other digging tools and without them, getting the cub out of the lake was much more difficult. That put me at least two days behind so I didn’t get to check on my runway crew. Supplies were pretty slim when I finally made it to them. They had made a 300 foot strip right where I wanted it. During their hunt they had been chasing wolf and wolverines but the caribou hadn’t shown up yet. They told me they had a chance at a giant grizzly, (a client took that grizzly the following year) however, that was not in our agreement. Dan and I brought them back to base camp a couple of days later where Eric would take a caribou and find out that he was accepted to med school. Even though they had only killed the one caribou they truly had an Alaskan experience and Mik was able to spend some hunting time with his sons. Dave Nelsen, WI, with his 9' 6" SCI record book grizzly. The "Mik's Place" camp is in the background at the green trees by the top of Dave's right ear and the strip runs on top of the bank about level with Dave's hair line. We normally named all of our camps so it was only fitting since Mik and his boys built the strip that we call the camp,”Mik’s Place.” Mik hunted this camp a few more times but like the bad camps I rotated the good camps also. Dave Nelsen, WI, with his 59" moose. Dave Nelsen, WI, with his B&C record book caribou. It scored around 420 B&C. You may have noticed that I have been calling the brown bears in this area grizzlies. That is because the Safari Club calls brown bears grizzlies in Unit 19. This created an identity problem for the bear since Unit 17 adjoins Unit 19 and he may get up in Unit 19 as a grizzly and go to sleep in Unit 17 as a brown bear then the next day could become a grizzly again. It really is a joke but that is their call. We ended up taking some record book grizzlies that wouldn’t even be close to a record book brown bear. The following year Mark and Steve Lanphier guided Dennis and Danese Minnich of PA, at “Mik’s Place.” Danese ended up shooting our largest caribou that year which scored 398 6/8 B&C. She also killed a 7’10 ½” black bear that scored 20 6/16 B&C which was our largest ever and a 57” moose. Dennis killed a nice caribou. Danese Minnich, PA, with her 7'10 1/2" black bear. It scored 20 6/16th B&C. Danese Minnich, PA, with her 398 6/8th B&C caribou. Fantastic palmation. Mik and Steve would be back at “Mik’s Place” in ’97 with Tom and Gary Clinton from IL, on a father/son hunt. 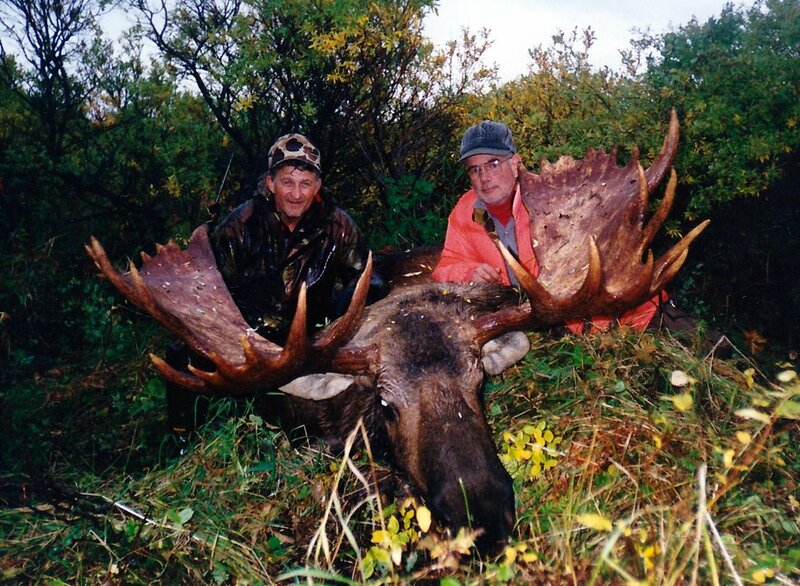 Gary ended up shooting a 65” moose the largest ever taken at that camp. This was Mik’s last season with AAA. Gary Clinton, IL, with his beautiful 65 inch moose. Tom Clinton, IL, with his 8' grizzly. This was Mik's last client at "Mik's Place." In ’98 Steve was by himself at “Mik’s” with Mac McCoy, an older gentleman from TX. 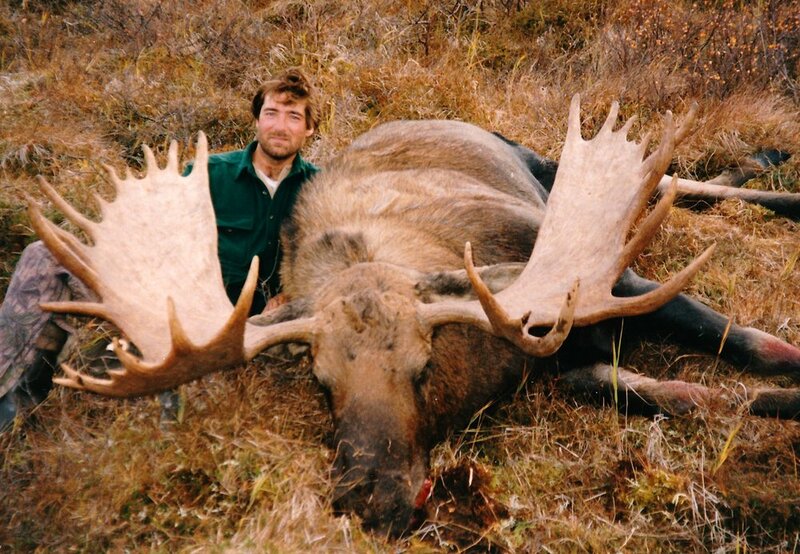 Mac killed our largest grizzly that year, a 9’4”, a 7’5” black bear, a 61” moose and a nice caribou. That camp just kept producing great hunts. Mac McCoy, TX, with his 9'4" grizzly. We changed guides in ’99. Thor Juliussen, my son-in-law’s brother had wanted to take a three specie hunter to “Mik’s Place.” He guided Sterling Gernert of PA. Sterling killed our first wolf out of that camp. The pack had continued to increase to at least 26. That was the largest number seen at one time, so who knows how many were really around. Sterling also killed an 8’6” grizzly, 55” moose, a caribou and a 5’6” black bear, five species total. You can’t beat that. Sterling Gernert, PA, with his five different species taken on his 15 day hunt. Around that time, the caribou started changing their travel patterns which didn’t include coming through that camp in large numbers as in the past and with the increase in the wolf population the moose numbers were going down. The bear numbers were still good so the camp kept producing. With the moose population going down, in 2001 after 9/11, I took two hunters and four guides out to “Mik’s” to try and shoot as many wolves up to the legal limit which would have been twelve. After two days of hunting they were finally getting set up on 23 wolves lying in the sun, however, the wolves heard the sound of the super cub coming when I was about five miles out coming to check on them and off they went without anyone firing a shot. They are really smart animals and that day very lucky. Tugrul Selek, Istanbul, Turkey, with his beautiful 8' grizzly. Tugrul was Steve's last hunter at "Mik's Place" in 2003. Unfortunately, Steve had to leave due to a family emergency, so John Koldeway guided Tugrul for the remainder of his hunt. My family and I got to visit with Tugrul and his wife Giacomina in Turkey a few years ago. They were gracious hosts. Steve had started to get withdrawal pains since he missed a year being out there. He loved that camp more than anyone so I tried to get him there at least once a year. Most of the guides liked getting back to the base camp after the hunt for a shower and my camp cooking and so did Steve but he loved that camp so much he told me he would just stay out there the whole season and I could just drop off the clients when they came into camp. The last couple of years before I retired I just let him stay out there. 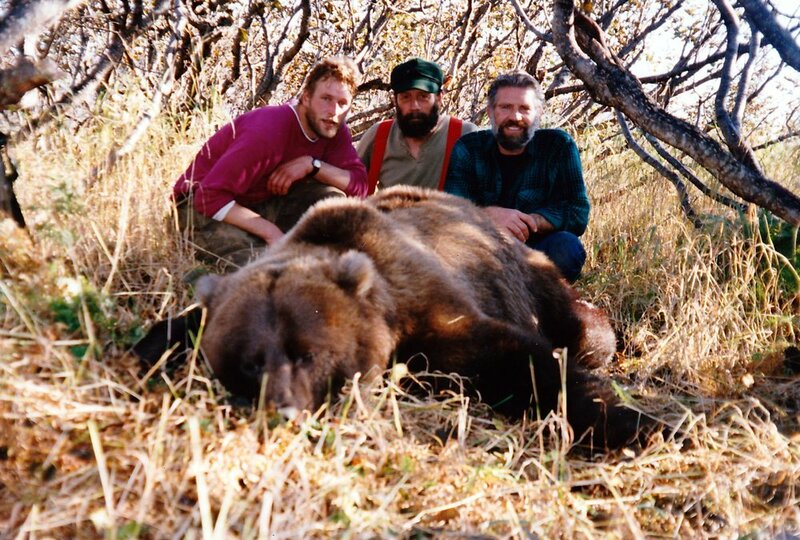 (L to R) Guides Mark Confer and Steve Lanphier and me with Don Renard's brown bear. This is the only picture I have of Steve. I continued to use “Hell Mountain” occasionally and finally found another place to land in Unit 19 in’03. It turned out to be another great camp but still wasn’t as good as “Mik’s Place.” I was told after I retired that two different guides who had worked for AAA started using both of those Unit 19 camps. Steve retired right after I did and has told me many times that what he misses most about being retired is not going to “Mik’s Place.” He considers that camp a very special place, a little piece of heaven. Thanks Chuck, Bret and Eric for the important roll you guys played in creating that special camp called “Mik’s Place,” where guides and clients alike have shared so many wonderful memories.